Review Summary: Hindi cinema is going through a major metamorphosis. Innovative ideas and fresh stories are being developed and executed by Gen X storytellers. Hindi cinema is going through a major metamorphosis. Innovative ideas and fresh stories are being developed and executed by Gen X storytellers. Thirteen-year-old Shambhu (Taher Sutterwala) is the archetypal adolescent who wants to get a hold on life but ends up all awkward antsy and alienated both from the bizarre adult world and the bullying peer world. Every generation deserves its own phrasegenerating movie that is made keeping children in mind. Those which have stayed for long and will remain are Satyen Bose 'Jagriti' (1954), Gulzar's 'Kitaab' (1977) and Nagesh Kukunoor's 'Rockford' (1999). Because they were made keeping children in mind and amazingly ended up with 'for all ages' tag. 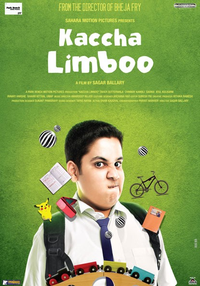 What Sagar Ballary failed in, is making Kaccha Limboo into a film that could improve his material sourced from life. Perhaps, his own. Kaccha Limboo demands a watch for some moments and the performances. But these apart it falls back as a mediocre project. Don't expect it to keep you entertained all the while.